Your Statement of Results includes your results for one year, including the following information. COURSE CODE AND TITLE lists the courses you studied that year. This includes TASC accredited courses, vocational education and training (VET) units (all listed as a ‘National Training Package’) and VET qualifications and recognised formal learning. SIZE of the course and points allocated towards achieving the TCE. 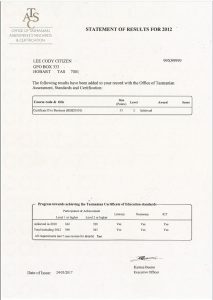 LEVEL shows the TASC course level from pre Level – Level 4. AWARD shows the result you have received for a course. SCORE shows the TASC Level 3 and Level 4 courses that can be counted towards university entrance. TASC will advise eligible students of their scores and ATAR. TCE PROGRESS details how you are tracking towards achieving the TCE. Please note, if you order a copy of your Statement of Results prior to 2009, the awards may be different to those listed above and include awards such as Higher Pass and Satisfactory Achievement.